If you blog, I'm sure there are times when you just can't come up with a decent title for your post. Often I write the whole post and then give it a title, and often, those titles are my best. But for this post, I new exactly what our title would be: Megan's Tick. No, Megan hasn't developed some neurological disorder that makes her jittery and jump. But she did most definitely have a tick. Yes, Megan had a "tag-a-long" in the form of an ectoparasite commonly know as "a tick". How exactly she got this tick is the question. We were at my parents' place last Sunday, and Megan and my Mom just back from shopping at the famous Aurora Farms complex. Their goal: find fall and winter clothes for Weston. But when they got back, Megan all of the sudden comes to me, dead serious, and says, "is this a tick on my neck"? I look, just underneath her hair, and sure enough, is a tick, buried straight down into her flesh. Ouch. Well, it didn't hurt, and the tick didn't look engorged with blood, but it was still pretty gross. On my adventures throughout Ohio, I often get ticks on me, but very rarely do I find them embedded in my skin. So how did Megan get this tick? Did it travel back with me from Shawnee from the previous Wednesday? Had it been living in my clothes, or worse, our sheets, for several days? Or did it travel back on me from Ottawa County, where I had been the day before? Or, did Megan, unlikely as it may be, pick it up from somewhere around our home in Worthington, or at the Aurora Farms complex? We'll never know, but it sure was gross. Megan laid down on the white carpet of the well lit living room, I got out the tweezers, and I performed my first tick-ectomy. First we rubbed some Vaseline on the tick, hoping to suffocate it. A few gentle tugs with the tweezers, and it wouldn't budge. I was quite surprised how embedded it really was- it was if the tick and Megan's skin was a continuous entity- pull on the tick and her skin stretched from her neck. A few harder tugs, straight out, and with what seemed like a little pop, the tick relented. Next question: Did it come out whole? I placed the tick on a paper towel and got out my macro lens: and the answer? I think, yes! A successful tick-ectomy. 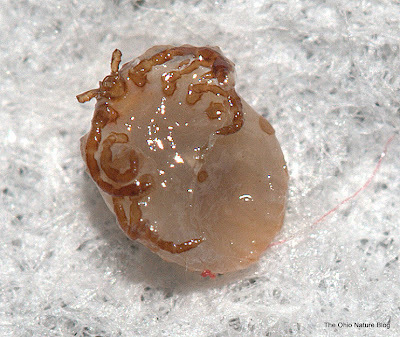 Ick, a Vaseline-slathered tick... ticks in any form give me the heebie-jeebies. I was gathering some tick information a few years ago and read several reports that said urban tick populations were becoming more common. Most of these reports were talking about Deer Ticks in cities along the east coast. One report from the CDC cited a study that determined the possibility of both Deer and Dog Tick populations becoming established in major metropolitan areas. Looks like ticks can find you just about anywhere now. How prevalent are ticks this time of year? I thought they were more of a spring and early summer critter. Hi Tom. I'm no tick expert, but I'm guessing this is a Lone Star Tick. If that's the case, it is most likely that you brought it home with you from Shawnee; the range maps I've seen don't show them in central Ohio. I know that after my trips to Missouri and southern Indiana, I've had hitchhikers that I've found several days later. Lone Star Ticks seem to be much more plentiful than American Dog Ticks or Deer Ticks, as a day in the field in Lone Star Tick country often yields at least 15-20 bloodsuckers. I couldn't tell for sure from the photos... how many legs did it have, and how small was it? Seed ticks (the larval stage of Lone Star Ticks) should be out in force right now, and would have 6 legs instead of 8. Just for your future reference, Vaseline doesn't work. 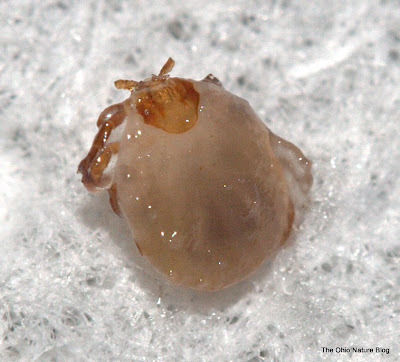 And the reason a truly embedded tick is so hard to remove is that it isn't just holding on with its mouthparts, it secretes a little of a glue-like substance, too. We're battling seed ticks at the moment - the six-legged larval ticks that one encounters by the hundreds. Just this morning I introduced a park visitor to the fine art of seed tick removal using duct tape. Just wondering if you know what happens if part of the tick is left behind? I've read all sorts of things, go to the doc, or it will get infected, to even just leave it and it will come out on it's own. Just curious! Congrats on a successful "tick-ectomy"! Yuck...wondered why it looked so strange...vasoline? I'll admit that I usually just take tweezers and grab close to the head and pull gently. Never left any parts behind. This year we picked up some of the tiny "seed ticks" in the woods....never had them before....and they left a bite that itched for months afterwards! I didn't think the bites would ever go away. I'm used to the bigger ticks that you just pull off and kill and forget about them. and i woke up this morning with a seed tick on my back. probably got it on mccormick island in orange lake. just yanked it off. check out "tick malaise." When Megan first asked me what was on her neck, maybe a misfitting tag sticking into her, and I told her that it looked a bite of some sort, I would never have believed that it was a tick, or that it looked like it did until Tom got it out and took a picture of it, magnified many times! I get lots of bites all the time, and simply itch them, and don't worry about where they came from or what they were. Now, I'm thinking maybe I need to be more careful! I hope this tick didn't leave any relatives lurking around here! Also, Megan was so brave! Amazing! Jana- That last image is fairly gross, isn't it? Steve- Ticks certainly can find you anywhere, but I'm likely to lean with Scott's hypothesis, that the tick came with me back from Shawnee. Whenever I visit southern Ohio, it seems as if I am always brushing ticks off me, fortunately, they usually aren't attached. Jain- That is a good question. I'm not exactly sure-perhaps they aren't as common now as they are in the spring, but they seem to still be around. My co-worker has told me some pretty horrid tick stories this mid and late summer. Scott- Well, I'm not sure how many legs it has, but it looks like eight. I have seen many lonestar ticks from Shawnee, so that is my best guess too, but I'm no tick expert. Others have mentioned to me that it might be a young lonestar tick. Swampy- Very intersting. I think this one has eight legs, but it is difficult to tell. I'll let my co-worker know about the duct tape trick, thanks! Megan- I should become a surgeon. Dana- I really don't know. Common sense tells me that all those things that you have mentioned are possible. I bet a doctor would extract the whole thing perhaps. I know one, I'll ask him. Mary- Looks like seed ticks are prevalent across the east this summer. Buford- I don't think Megan has any sign of disease yet, but it hasn't been two weeks. Mom- Yep, she was quite brave. Rashed- I promise, you won't get any ticks when you visit Ohio. Yikes! I totally have the willies now.....and the creeps.....and I'm running my fingers through my hair because I was in the woods a good part of today!